Reliable Fire Fighting products are critical for first response bush fire protection for rural bush fires, burning of fire breaks, mopping up and ember attacks. It’s essential to source the best quality and effective firefighting products for first response bush fire attacks and prevention for your property. Always look out for the Fire Danger Rating Today sign and make note of any potential dangerous conditions. Once you have assessed the risk, you will need to make a decision as to which Fire Equipment should be deployed in the event of an emergency. As a first line of defence against bushfire, you should keep up to date with your local bush fire authority alerts and adhere to their instructions. Never risk your life or the lives of others, by always ensuring that your bush fire equipment is in excellent serviceable condition, check and test regularly to ensure that you are properly prepared. Mains water pressure may drop or fail in a fire situation and as a result, you should have an independent water supply for firefighting purposes. This should be at least 50,000 litres, to assist in the defence of your home and property. In order to maintain sufficient water supply to actively defend your home, you should have a generator with more than 1.5 kVa capacity to drive a home pressure pump or a petrol or diesel firefighting pump. 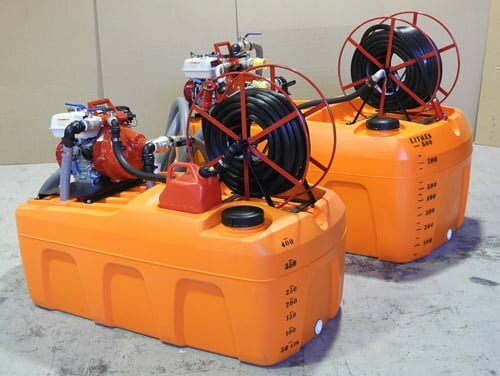 Pumps and generators should be able to pump a minimum of 400 litres per minute (lpm) and must be shielded from high temperatures caused by a bushfire. It is important that everyone likely to stay and defend your property knows how to start and operate the pump and generator and have practiced this on a regular basis each year and tested prior to the fire season. Fire hoses should be durable, flexible, able to withstand high temperatures, have UV protection, be long enough to reach all corners of the home and should be fitted with a nozzle able to deliver at least 30 to 100lpm. Hoses should be kept on a reel for ease of handling and storage. One of the most important factors relating to the protection of water tanks when exposed to fire, is keeping the area surrounding area clear of vegetation. Make sure that your preparation for the fire season included removing any vegetation or flammable materials from around your water tank. Flash Fire manufactures and supplies first response rural bush fire-fighting equipment and sources the best quality products available for effective bush fire attack and prevention and is a member company of the Fire Protection Association of Australia and is also a committed Green Business Skill company member. 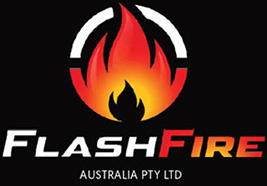 With many years’ experience both in Australia and internationally, Flash Fire Australia has the experience to provide you with quality Fire-Fighting products and service. Flash Fire products are for first response bush fire protection for rural bush fires, burning of fire breaks, mopping up and ember attack and are suitable and adaptable to many industries, including agriculture, forestry, rural and commercial applications. 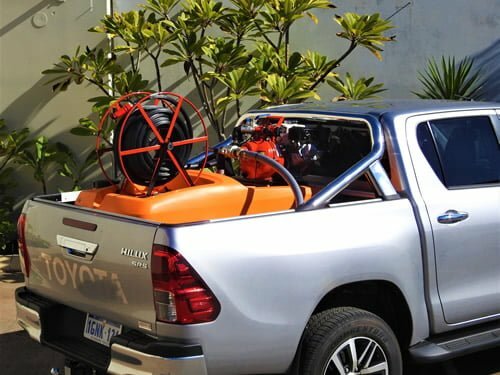 The 800L baffled Flash Fire Ute firefighter is designed to fit onto all flat tray top utes with a carrying capacity of one ton or more. The 400 litre and 800 litre Flash Fire battled tanks can easily be fitted to a trailer. 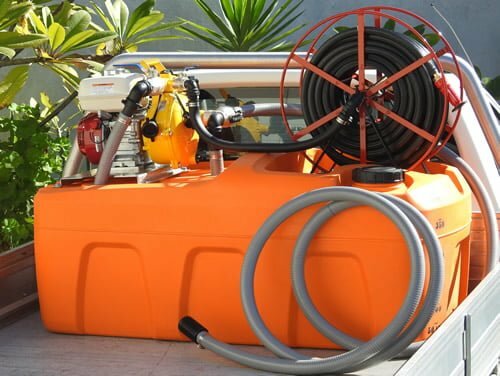 The Flash Fire Skid Pack consists of a base assembled with a steel powder coated hose reel, fittings and a Davey fire fighter pump. 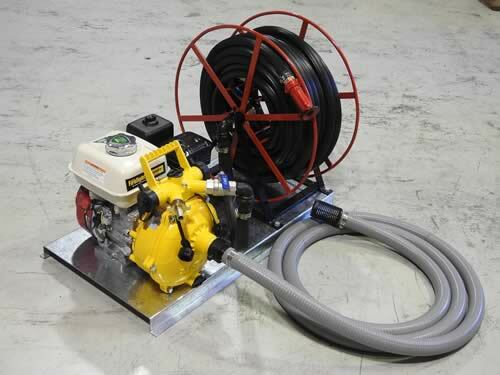 Flash Fire distributes the ever reliable and dependable Davey fire-fighting pumps. 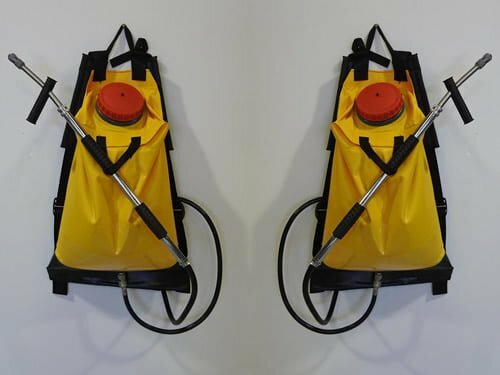 The Flash Fire Knapsack and Sprayer is effective for extinguishing fringes of grass fires, mopping up and ember control. The Flash Fire Beater is regarded as one of the most useful and effective bushfire tools. Flash Fire manufacture the Ute Bladder Tank. 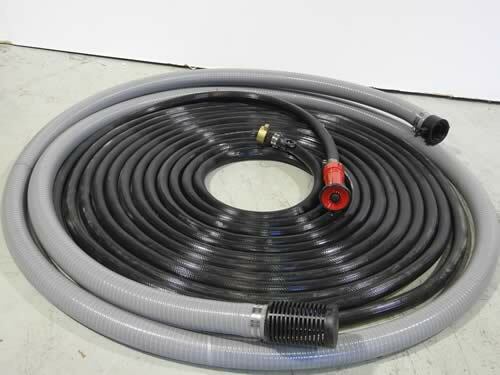 Flash Fire Hose Kits consist of high-quality suction hose and Australian Standard fire hose. Residential rural and commercial sites have different firefighting requirements, which are outlined in the Building Code of Australia (BCA) and Australian Standard 2419. You also need to check with your individual local government, which is also responsible for ensuring that the appropriate fire protection design requirements are included in a building. Every State in Australia also has different requirements for Fire Fighting for Farm Sheds, so you will also need to contact your local Authority to find out what is expected in your area. You will need to contact your local Government Authority to determine the specific requirements in your area. More information can be found in the Building code for “Farm Buildings/Sheds” Publication and Practice Note 2015-67. The Rural Fire Service Queensland (RFSQ) is a volunteer-based firefighting agency and operates as part of the Queensland Fire and Emergency Services. Ask the RFSQ about water tank requirements and tank fitting specifications in Qld. The New South Wales Rural Fire Service (RFS) is a volunteer-based firefighting agency and statutory body of the Government of New South Wales. Ask the RFS about water tank requirements and tank fitting specifications in NSW. The Country Fire Service (CFS) is a volunteer based fire service in the state of South Australia. The CFS operates as a part of the South Australian Fire and Emergency Services Commission (SAFECOM). Ask the CFS about water tank requirements and tank fitting specifications in SA. The policy has been legislated to ensure the CFS and MFS can access required volumes of fire water in the event of a fire. The CFS policy requires various water storage capacities, depending on the size of the shed and its intended use. Water storage tanks must be installed no closer than 10 metres from the shed, but no further than 30m. This is to allow a firefighter protection zone away from the potential fire and safe access to the water tank but close enough for the CFS to reach the flames. The tank must have a hard suction assembly which includes two CFS 63-millimetre outlets and one 125- 100mm Storz outlet for the MFS. The suction will also require a 150mm Anti-Vortex Suction Plate. Other requirements for tanks under the policy is fi re tank signage and water level indicator. A hard stand area is also required adjacent to the tank for the attending fire-fighting truck. Overland Services are Heritage Water Tanks South Australian Distributor and specialise in the design, supply and installation of Fire Water Storage Tanks and complete Fire Hydrant Systems. They also provide the complete Hard Suction Assembly, Fire Hydrants and associated components, which are manufactured in-house, allow Overland Services to offer cost effective solutions to clients. The Department of Fire and Emergency Services of Western Australia (DFES) and the Department of Parks and Wildlife (P&W) have joint responsibility for bushfire management in Western Australia. DFES is an umbrella organisation supporting the Bush Fire Service, Emergency Services Cadets, Fire and Rescue Service, State Emergency Service, Volunteer Emergency Service, Volunteer Fire Service, Volunteer Fire and Rescue Service, and the Volunteer Marine Rescue Services. Ask the DFES about water tank requirements and tank fitting specifications in WA. New reforms took effect in April 8, 2016 that identifies bush fire prone areas and building and planning requirements for new homes built in bushfire-prone areas. The Department of Fire and Emergency Services prepared a map which identifies the bushfire-prone areas across the State. A bushfire hazard assessment is now required for new homes in areas identified as bushfire-prone on the map. The assessment will determine the level of construction standards for bushfire resistance to be applied, as identified in the Building Code of Australia and the Australian Standards AS3959. Th new planning requirements affect landholders and land developers and in area that do not have mains water supply, water tanks for fire fighting purposes with a hydrant or standpipe must be provided and meet the following requirements: Volume: minimum 50,000 litres per tank; Ratio of tanks to lots: minimum one tank per 25 lots (or part thereof); Tank location: no more than two kilometres to the further most house site within the residential development to allow a 2.4 fire appliance to achieve a 20 minute turnaround time at legal road speeds; Hardstand and turn-around areas suitable for a type 3.4 fire appliance (i.e. kerb to kerb 17.5 metres) are provided within three metres of each water tank; and Water tanks and associated facilities are vested in the relevant local government. More information about this can be found within the Bushfire Guidelines. The Water Corporation also recommends that you provide an independent supply in the event that mains water supply is disrupted during a fire. Bushfires NT is the lead government agency for rural fire management in the Northern Territory. Under its jurisdiction, there are six fire control regions in the NT. Bushfires NT’s primary roles are to administer the provisions set out in the NT Bushfires Act and support Territory landholders in fire mitigation and management. There are Bushfires NT offices in Darwin, Batchelor, Katherine, Tennant Creek and Alice Springs. Ask Bushfires NT about water tank requirements and fire tank specifications in NSW. For more information about our fire ready steel water tanks, please contact us on 1800 115 552. Research into the performance of water tanks in bushfire, R. Blanchi, J.E. Leonard, N. White, A. Sargeant, A. Bicknell, S Andersson CSIRO – Sustainable Ecosystems (CSE) Urban Systems Program, 2007.